The heirloom rosaries are the highest quality rosaries and will stand up to heavy use through multiple generations. The super strong wire is virtually unbreakable. 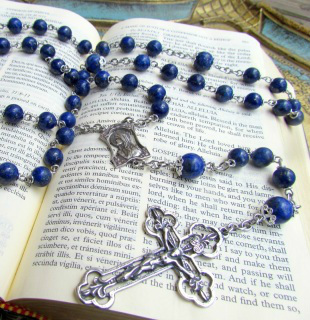 The rosaries on the pages below are made with strong 20 gauge or thicker solid wire. For my Heirloom Rosaries, I use Sterling Silver, bronze, brass and stainless steel wire to hand-turn each individual rosary bead. Available Heirloom Rosaries ship next day. 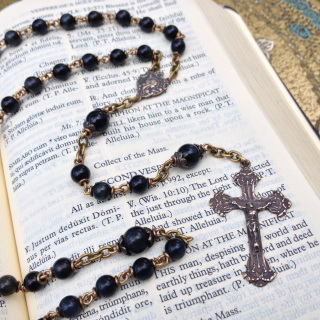 Please allow 2 weeks for shipping of custom ordered rosaries. 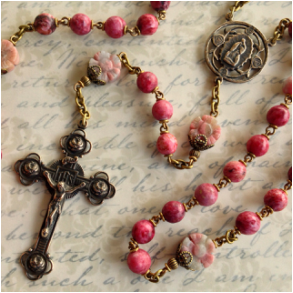 More information on the Rosary Buying Guide page. are constructed from tarnish-resistant sterling silver Argentium wire, with 6 or 8mm Gemstone Ave Beads, and solid sterling silver pieces. Click the image above to view my Medium and Large-size Sterling Silver Heirloom Rosaries. have 8mm Gemstone Ave Beads, and are approximately 25 inches in length from the crucifix to the middle of the second decade. Click the image above to view my Bronze Heirloom Rosaries. have 6mm Gemstone Ave Beads, and are approximately 22 inches in length from the crucifix to the middle of the second decade. Click the image above to view my Bronze Heirloom Rosaries.